Missouri Gov. Mike Parson speaks at LaunchCode Tuesday about his desire to work with the legislature to fix two bills he vetoed earlier this year. During a statewide tour on Tuesday, Missouri Gov. Mike Parson said he wants work with lawmakers to fix two bills during next week’s special session. Parson vetoed a bill to increase STEM education in high school and another to expand alternative prosecution for drug abusers, known as drug courts. 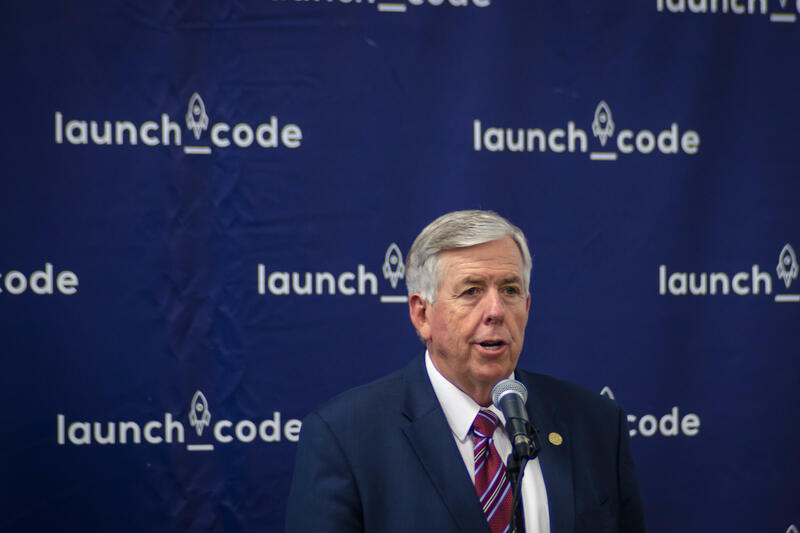 Despite the vetoes, Parson is making it clear he still supports the spirit of the laws and would rather see them reshaped than overridden by lawmakers as currently written. Parson called for the special session in a letter to lawmakers last week. The Republican governor made three stops Tuesday to promote the session, including one in St. Louis. He visited LaunchCode, a nonprofit computer coding training center. While at the center Parson said STEM training is important for the future of everything from cybersecurity to food security. “The only way we’re going to do that — I can tell you that from being a farmer myself — is through science and technology,” Parson said. The bill the governor rejected would allow high school students to apply computer science classes as required math or science credits in order to graduate. The veto was based on concerns that the legislation overly favored one company. The drug court expansion legislation, Parson said, dealt with too many tangential issues to hold up legally. “We made some minor changes in them that we believe will get them fixed,” he said. Some of Missouri’s largest gaps between unfilled jobs and skilled workers to fill them are in technology and computer sciences. Workers with STEM education earn about 25 percent more income than those who don’t, according to the state Department of Labor. The Missouri Chamber of Commerce, however, has called for large-scale changes to STEM education to match demand. Workforce development has been an area of focus for Parson over his time as a lawmaker. The special session is scheduled to begin next week.